We're currently in beta and will be coming to your neighborhood soon. Sign up to join the waitlist for early bird access. Our project began with a simple idea: delicious, restaurant-quality food should be highly deliverable. It should stay crunchy in all the right places, but tender in others. Buns should be fluffy; salad greens, crisp. Now, after thousands of hours of research and recipe development, we’re proud to introduce a menu that is crafted specifically for delivery. 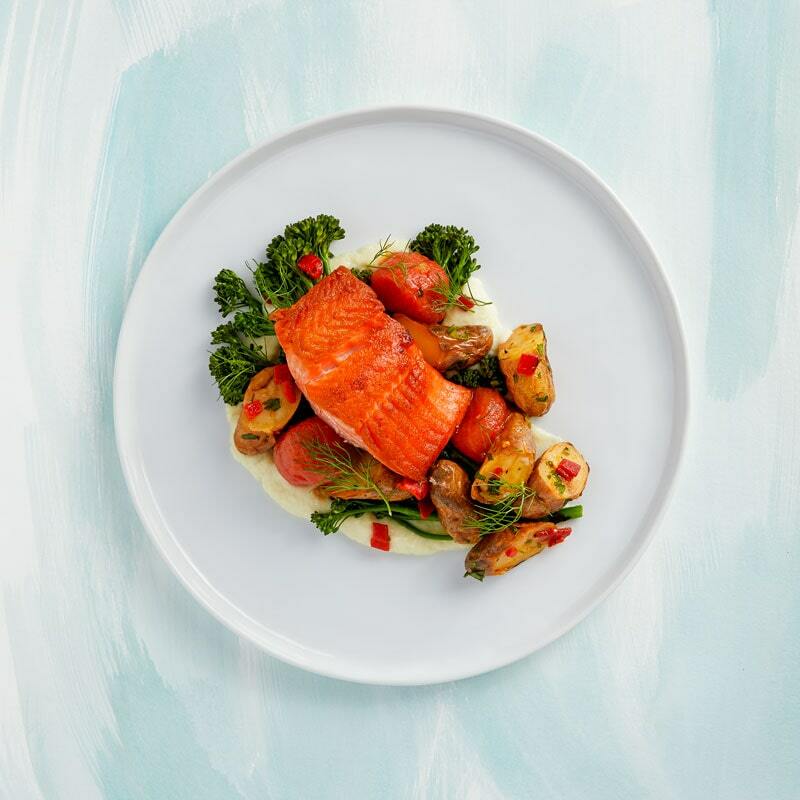 It features a rotating selection of dishes, like Seared Salmon with Piquillo Gremolata and Roasted Mushroom with Kale Polenta, that are prepared to order by our chefs and delivered to your door within 30 minutes. The result is a delivery experience that’s so civilized you may want to put a napkin in your lap (but we won’t tell you how to live). We're currently in beta and are coming to your neighborhood soon. Sign up to join the waitlist for early bird access. Shaved Chiogga beets, cara cara citrus, fennel, mint and jalapeno. Berbere glazed vegetables with lamb couscous, mint and carrot harissa. Jasper Hill cheese, Ithaca milk, whole-wheat pasta, crispy breadcrumbs. 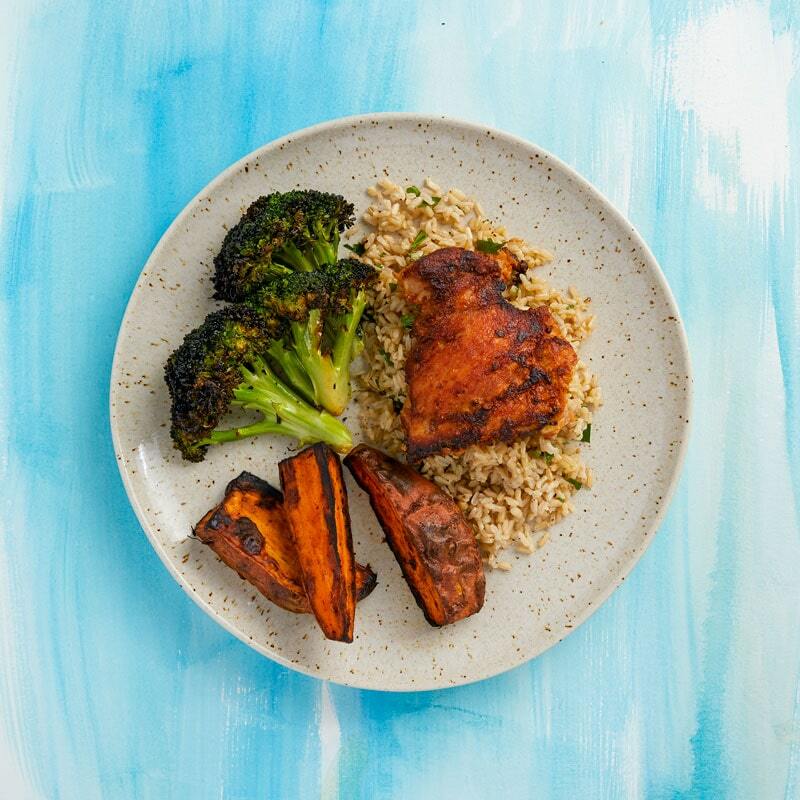 Boneless chicken thigh, brown rice, roasted sweet potato, charred broccoli. No waste vegetable broth, tofu, shiitake mushrooms, roasted carrots, jasmine rice, thai basil, mint, ginger. Wild Alaskan salmon, fennel, fingerling potatoes, broccolini, confit tomatoes, piquillo gremolata. Fudgy chocolate brownie with black beans, chocolate chips and Maldon salt. Minced herbed chicken, toasted brioche bun, feta, roasted tomato, pickled onion, frisée lettuce, chive aioli. Served with salsify crisps. Double baked sweet potato, charred poblanos, cauliflower, shiitake bacon, smoked hemp seeds, scallions. Favorite thing to get from delivery? I like pho. Beef tendon. Lots of fresh herbs. Lots of noodles. When the vegetables are overcooked. Thai or Chinese… it comes in a very viscous sauce that is piping hot. Cold food is really frustrating. Uncle Boon’s Sister: Thai basil stir fry, topped with an egg. It’s spicy, it comes really hot, and it’s saucy. Paying too much for something that wasn't very good. We’re currently rolling out a beta release of Room Service in downtown NYC. Sign up to learn if you’re in our launch zone and get on the waitlist to try Room Service from Dig Inn. Not located in downtown Manhattan? Don’t worry— we’re coming for you soon. Sign up here and be there first to know when Room Service comes to your neighborhood. Dig Inn serves thoughtful, nourishing food that’s sourced directly from farmers and prepared from scratch daily by chefs. We believe that the simple act of enjoying a meal can be a powerful step towards building a better food system.